and the stuff is good! manigeek likes it! Ooooh! 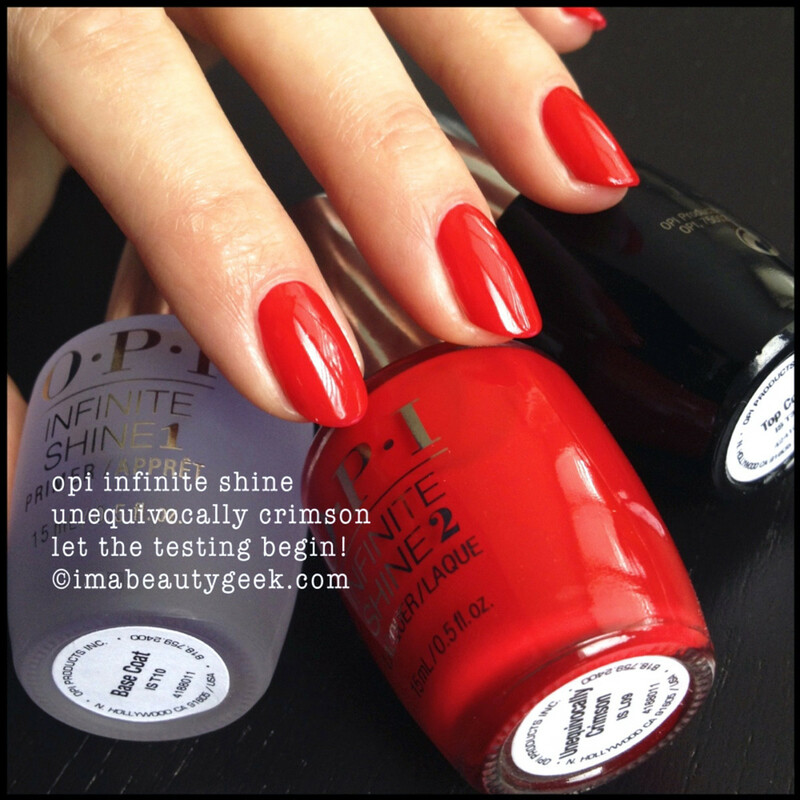 OPI Infinite Shine has finally launched and I tell ya what, I haven’t been this excited about a product launch in a really long time. 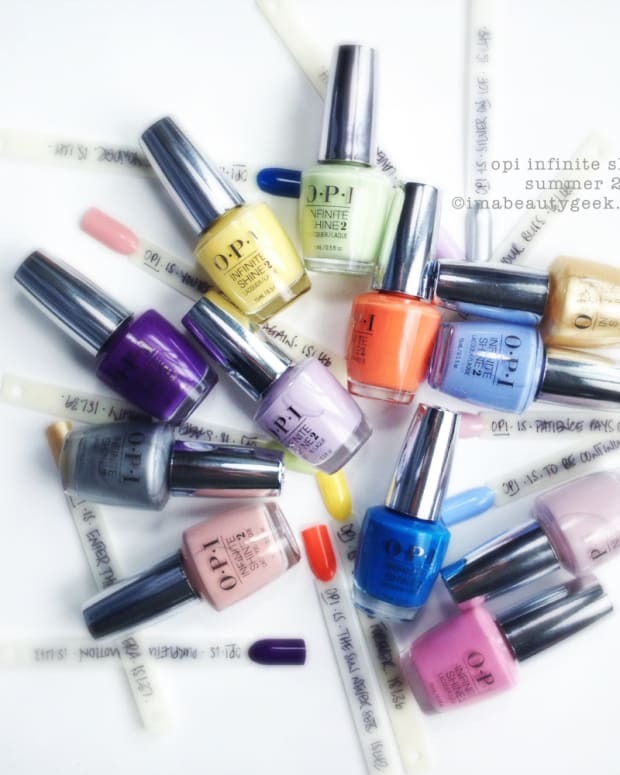 I love OPI. I can’t help it. It’s my favourite. 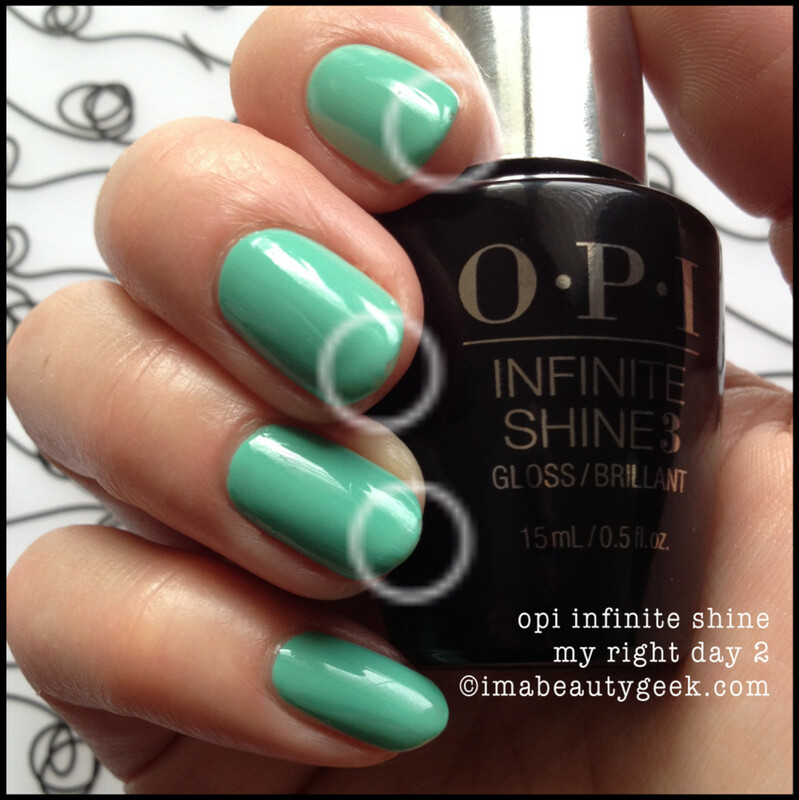 And this Infinite Shine is supposed to be OPI&apos;s answer to long-wearing polish. Yes, polish. It’s not gel. It’s polish. This here post is a long one - get a cuppa coffee &apos;n a sammich &apos;n have a seat! While you&apos;re reading and looking at all the pictures, you&apos;ll need to keep in mind that one shift at work for me (and for my awesome polish-tester Amanda) is probably equal to about three days of normal wear for most people. My hands are crazy busy being stuck in chemicals and water and scraping up against all manner of things. They&apos;re abused. A lot. 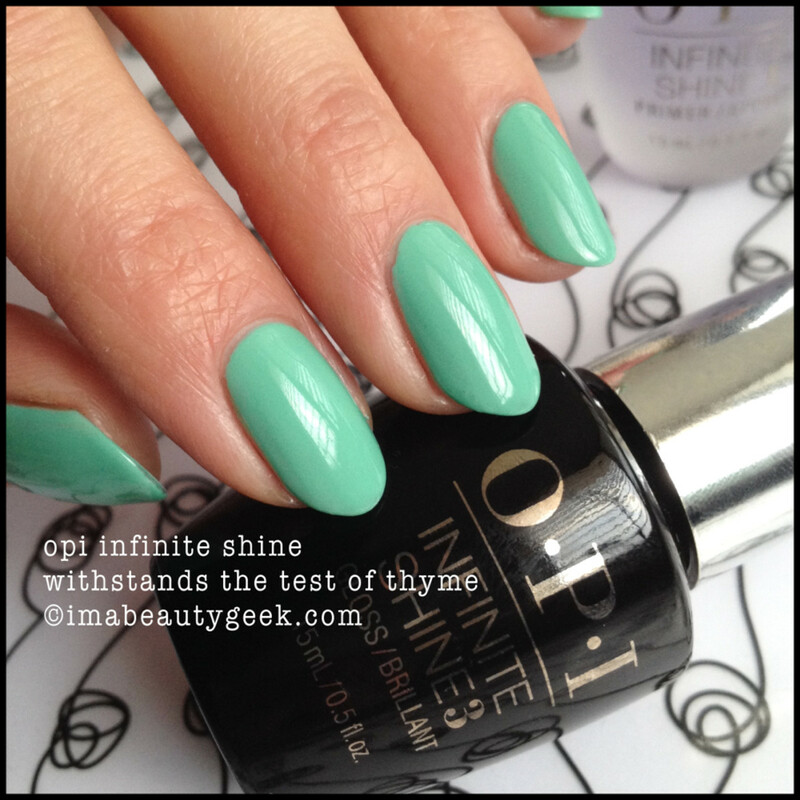 So what is OPI Infinite Shine? Well, there are three components – base, colour, top. You paint ‘em all on like you do with any regular polish. Then you wear it. Then you take it all off with acetone like you would any regular polish. Easy, right? I know lots of you are getting tired of waiting patiently for reviews to roll out so what have I decided to do for you? I’ve decided to do a review as I’m wearing the stuff and you can just look at the day by day pictures as I take them. I’ll update daily (hopefully) until I can’t stand it and have to take it off. How ’bout that! At this time, I only have two shades – there’s been a supply issue here in Canada on account of those new silver caps – they can’t manufacture them fast enough to ship them so that’s why we’re seeing a little lag in terms of the product being in-store here in Canada. It’s coming though – Suzi told me herself. See? 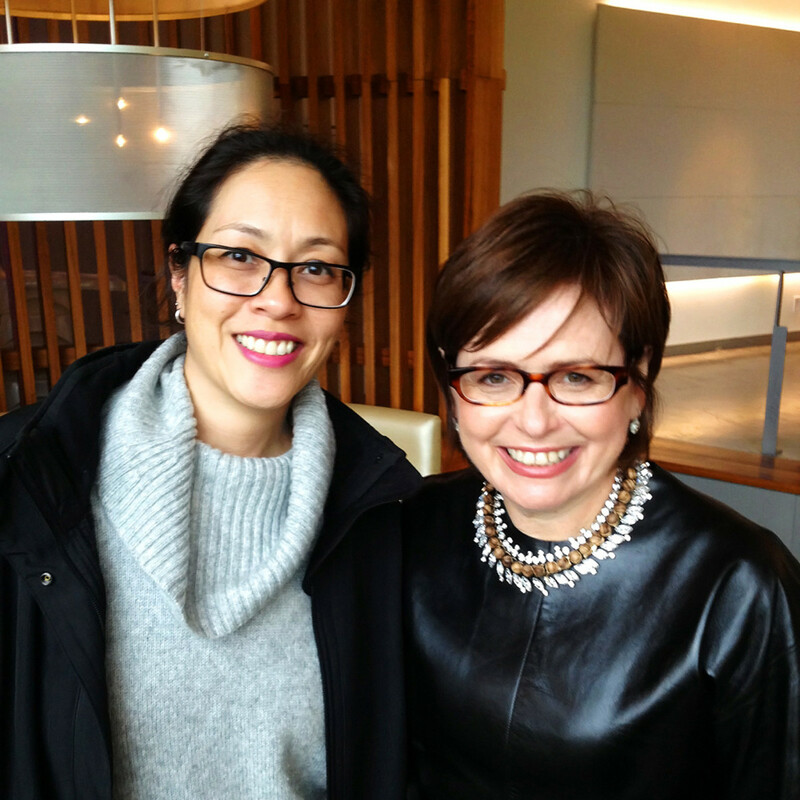 There’s Suzi ’n me! 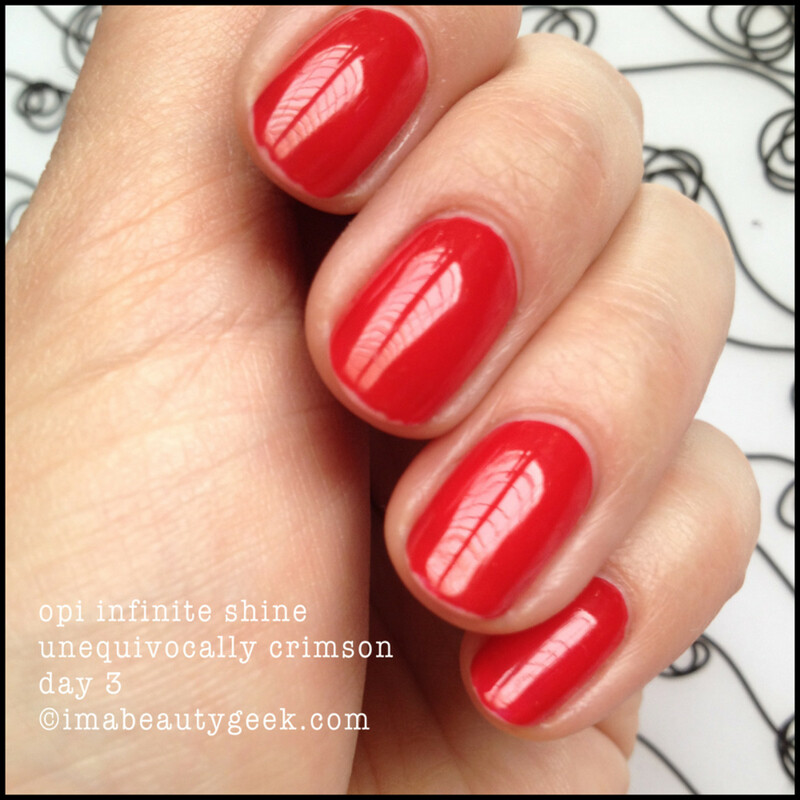 I’ve tested the red I got – it’s called OPI Infinite Shine Unequivocally Crimson and it’s a solid poppy red. Yes, you probably have a dupe but I ain’t interested in dupes. I’m interested in wear time. Here’s the shot right after I put on the base, two coats of colour (beautifully pigmented, slightly thin, shiny, and awesomely quick to dry, so be fast and even in your application), and one coat of top. The top coat needs to be applied a little thicker than you think to get good coverage and decent level. Unequivocally Crimson goes on splendidly. It’s a nice flowy polish that just goes exactly where you want it to. Instructions say to use two coats, so use two coats. I did get some colour transfer from my colour coat to my top coat brush; don&apos;t be surprised if the same happens to you. Oh. That’s day three on my left hand. My left is not my dominant hand so if that’s the wear on my left… yeah – I couldn’t bear to show you my right. It wasn’t pretty. There’s my left again – you can see the wear at the tips. Ugh. Too much wear after only three days. I know the pictures are fuzzy but it’s wicked hard to focus my phone on such a puny little area… sorry! I had to take it off and I didn&apos;t have any staining or nuthin&apos;. It was only 3 days - booooo. Still shiny though! Did I mention I have a polish tester? Yep, I do. Her name is Amanda and she’s kind of a nail polish nut so it works out well for both of us. We work together so I know her nails are going through pretty much the same thing mine are. She wears the stuff, she comes to work, I shoot the stuff. The lighting in bars is notoriously not good so again, excuse the crummy photos. Amanda’s non-dominant left hand after four days. She somehow managed to wear it longer than I did, and neither of us is a fan of chipped polish. What a trooper she is, right? She shows pretty good lasting power at the free edge of most nails but that middle nail – that’d make me crazy! Amanda’s right hand after four days of Unequivocally Crimson. Oh. That’s not good. Lots of wear and lots of chips. And this girl knows how to apply polish. She used base, two colour coats, and top. And she capped the free edge too. Four days. Harumph. Amanda after six days of wear, removal, and a shower. 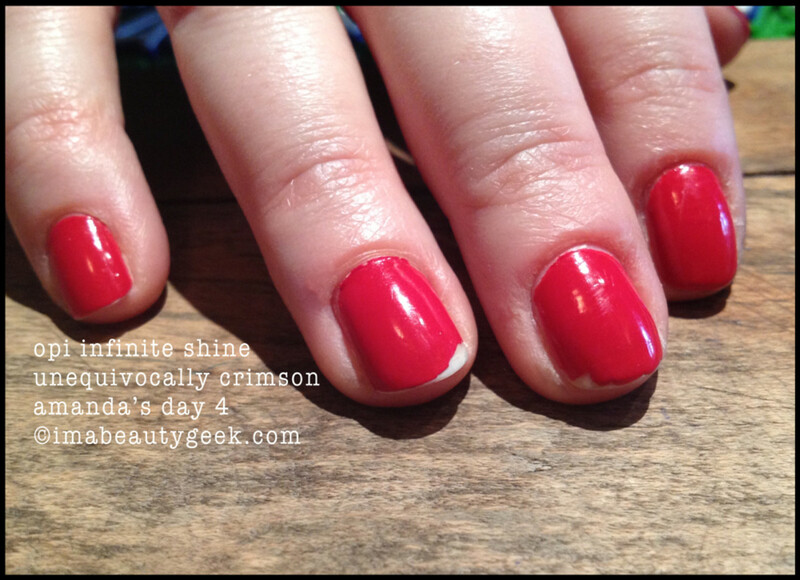 Oh, hello totally red stained side walls and cuticles. To me, this is totally unacceptable. 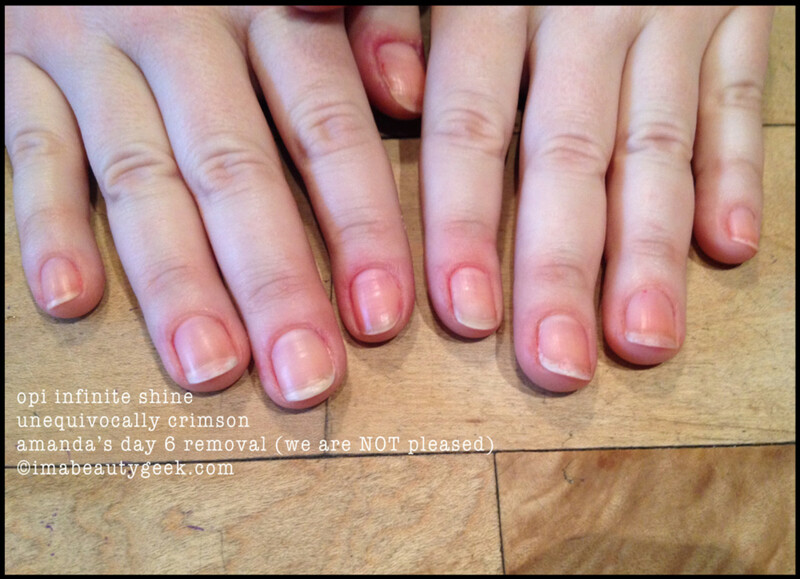 The base coat might have protected her nail beds from heavy staining (they’re still stained though) but it did nothing to protect the rest of her finger parts from becoming Unequivocally Crimson. We’re done with this shade. For Amanda and for me, it’s a fail. 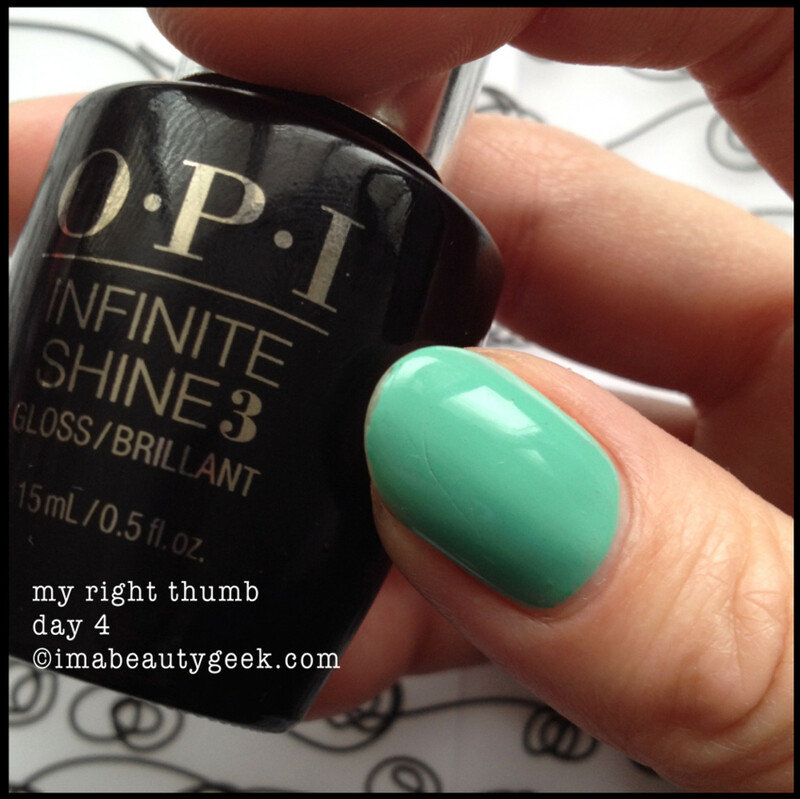 It’s pretty ’n everything when you first put it on, but it wears like any other regular polish and it stains. Pass. So let’s move on to shade number two! It’s called Withstands the Test of Thyme and I guess we’ll see if it really does or not, huh? Here’s me with my initial application on my left hand. Base, two coats of rather thick gloopy consistency colour coat, and one generous coat of top coat. You can see the uneven line around the cuticle of my middle finger – like I said, the polish was thick and not so flowy so I didn’t get the cleanest lines. I apparently also missed a spot on the free-edge of my thumb. Ooops. Day two on my left thumb looks like this. I scratched it somewhere and from most vantage points, it’s really unnoticeable. See – you can hardly see them thumb nail scratches, right? And you can also barely see the wear at the tip of my index finger, right? Not bad considering I slapped this stuff on at 3pm, rolled out to work at 4pm and then worked a few hours. If we look at it from this angle, we can see the edge at the tip of my index is actually a little worse than you think. Barely visible if you’re looking at it with your eyeballs but with a photo, it shows remarkably well. Left index wear again – see? Hardly visible and totally tolerable wear showing on day two. Let’s have a look at my right hand! It’s my dominant and it definitely shows more wear on day two than my left does. I mean it’s not terrible but if you know me, you know I think any chips or wear is pretty much intolerable. There’s all the stuff I can see that makes me crazy. There’s also minor wear on the pinky but no chips – just wear. You know I capped the free edges real good, right? It’s how I do. Oh – lookit all that wear on only day two. It looks worse than it is though, and I’ll wear it again tonight for a full 8 hours and shoot again tomorrow morning. You gonna show up to see what day 3 looks like? I know I am! 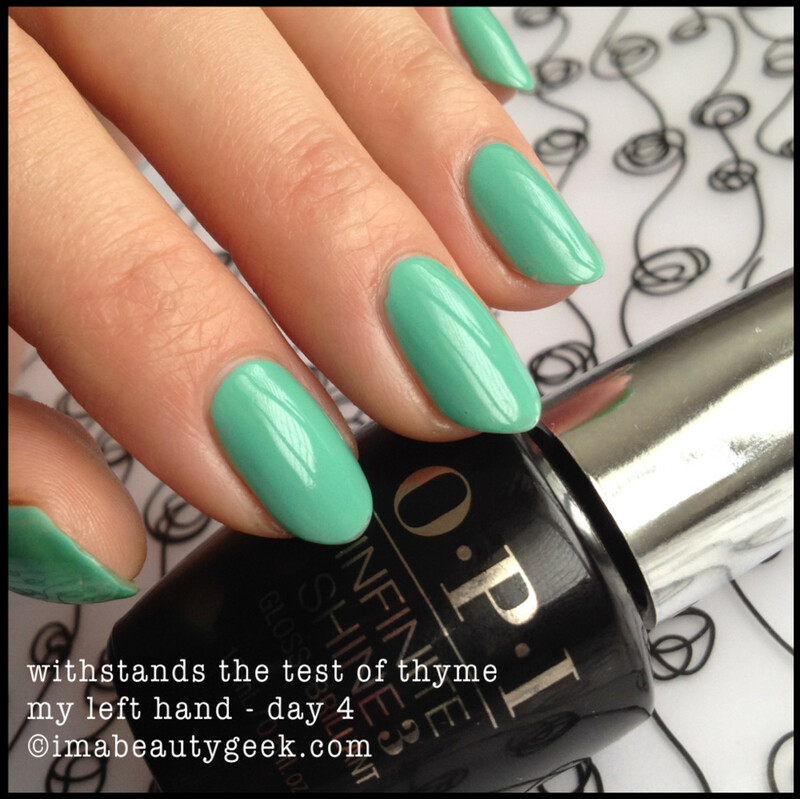 Right now Amanda has the bottle of Withstands the Test of Thyme and she’s just slapped it on and sent me a pic! She says it went on pretty well and she waited one minute before topcoating. It looks good! No streaks, nice level, and she capped the free edges. Tomorrow she promises to send more pictures! Here&apos;s Amanda&apos;s day 2 left - she put the stuff on just yesterday morning and after working her 8 hours behind the bar last night and her 6 hours on the floor today, it looks pretty much perfect! That&apos;s 14 hours of nail polish hardship and I gotta say I&apos;m impressed with this total lack of wear on her left hand &apos;cause I really understand what she&apos;s been doin&apos; with them hands. And her right. Oh. Water is the enemy of all nails and nail products. Water = death to polish. Water = evil. Amanda tells me there is a small split in her middle finger nail that was already there and that&apos;s what accounts for that nice big chip. 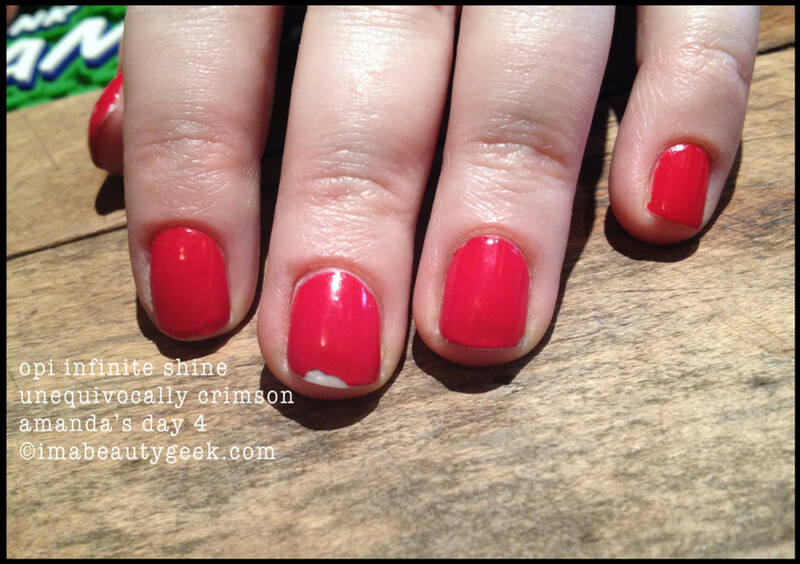 She also says that nail is very thin in that spot. I say nope - polish should stick and be flexible enough to bend with your nail instead of chip - that is if you use your hands for normal things. We don&apos;t use our hands for normal things. We beat the crap out of our right hands - we use them badly for 8 solid hours and if a polish lasts though a single 8 hour shift, yeah... that just doesn&apos;t happen. In our world (believe it or not) this is pretty close to lasting through an 8 hour shift. This result is actually stellar for us. I know you&apos;re having trouble believing that but if you saw what regular-normal polish looked like after 8 hours, you&apos;d be stunned. My non-dominant left day 3: There&apos;s a little tiny bit more wear at the free edge of my index and a very slight amount of wear starting on my middle. My non-dominant left thumb day 3: the scratches from yesterday are still there and still nearly invisible but apparently, I have a new chip-scratch in a really weird spot. My dominant right day 3: that&apos;s definitely more wear at the tips. My dominant right day 3: it&apos;s almost too much for me to handle. But mostly, it just looks like wear and not chips. And it&apos;s far less than I thought it&apos;d be after 2 shifts at work. You gotta keep in mind that what I use my hands for is more than likely not what you use yours for (unless you&apos;re also a bartender or always have wet hands). If this was a darker shade, this kind of wear would be 100% unacceptable and I&apos;d have removed it by now. The lighter the shade, the less evident the wear at the tips is. Wear on lighter shades is much less visible to the naked eye so keep that in mind. Photos show the wear real good! My non-dominant left on day 4: that&apos;s really minor tip wear showing on the index finger and the middle tip shows starting signs of real wear. Interesting how the wear doesn&apos;t seem to have progressed between yesterday and today - even after a full night of work. It&apos;s like it all just stopped. It&apos;s almost like I didn&apos;t use my hands at all last night but I did. I really, really did. Kinda neat, huh? And my left thumb: really not much movement on that wear either. The scratches are still barely visible and my weirdly placed chip-scratch is maybe microscopically bigger but really no discernible differences between yesterday and today. Like, what? And the final day 4 shot of my left hand looks like this. Remember I said the camera picks up waaaaay more imperfections than your eyeballz do? I shot this in eyeball perspective for you! Fascinating, right? It looks like a brand new manicure that I just did! G&apos;head &apos;n scroll back to compare it to the day 1 photo - amazeballz! If you click this image to make it bigger, you&apos;ll see the touch of wear on my thumbnail and on my index finger. There&apos;s really minor wear starting on my middle finger and there&apos;s a little chip on the edge of my ring finger that I didn&apos;t even notice before. Colour me amazed. Seriously. That&apos;s FOUR days. Four days for me is like 7 days for you. Trust me. Amazed. But we should maybe look at my dominant right hand on day 4 huh? I&apos;m not gonna put those circle things on this picture because I&apos;m pretty sure you can see the wear. It has progressed a little more and is enough wear &apos;n tear for me to NEED to remove this polish. 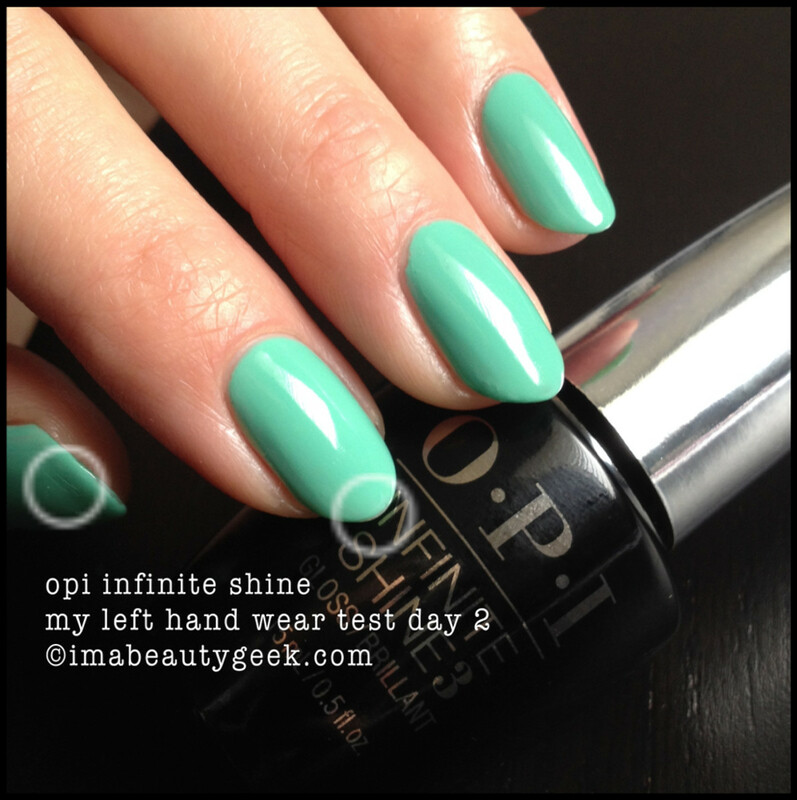 This part is really important to note: I gotta tell you that this wear you see on day 4 with OPI Infinite Shine is the wear I normally get on day 1 with any other regular polish/top coat combo. True story. If I paint on some regular OPI and go to work, after one 8 hour shift my right hand nails look exactly like this and off the polish comes. But this is FOUR days!!! Like, what? Yeah - for me, this stuff lasted FOUR times longer than regular polish. And here&apos;s my right thumb: it shows marginally more tip wear than it did yesterday but again, after working another 8 hours on top, I&apos;d expected it to be much, much, much worse. What kind of science is this?? 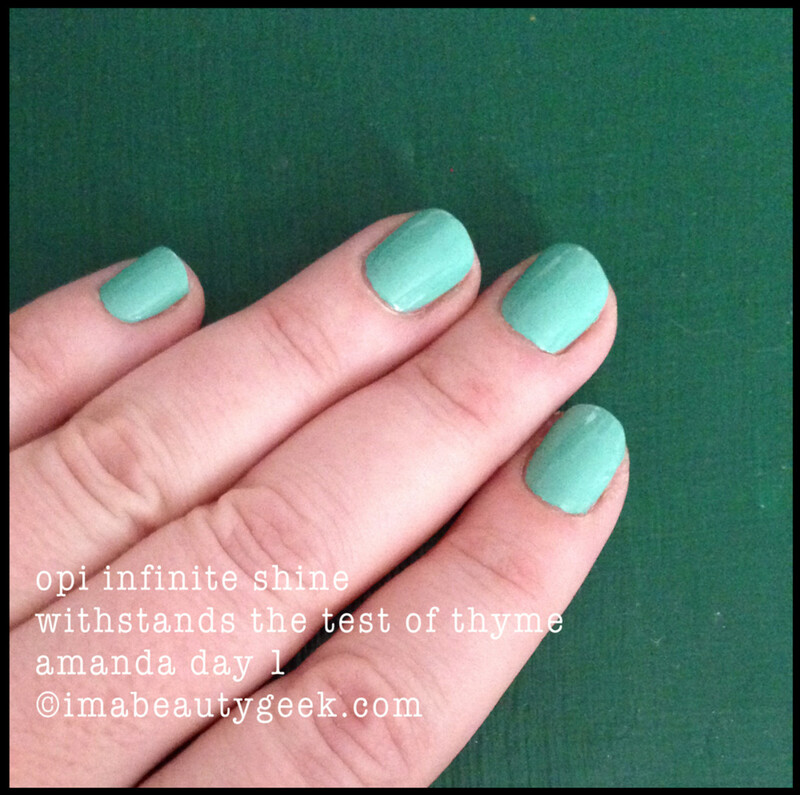 Finally, the normal perspective view of my day 4 of Infinite Shine Withstands the Test of Thyme. The close-up shots really show the wear but with a light shade like this, if I was maybe someone else, I could still handle wearing this for another day. From arms length, the wear is actually pretty minor and there are no significant chips like the ones Amanda shows on Day 2 (she&apos;s been in more water than me though). That black thing on my ring fingernail is just lint. But to me, this amount of wear is too much. It&apos;s making me nuts. Off it comes! 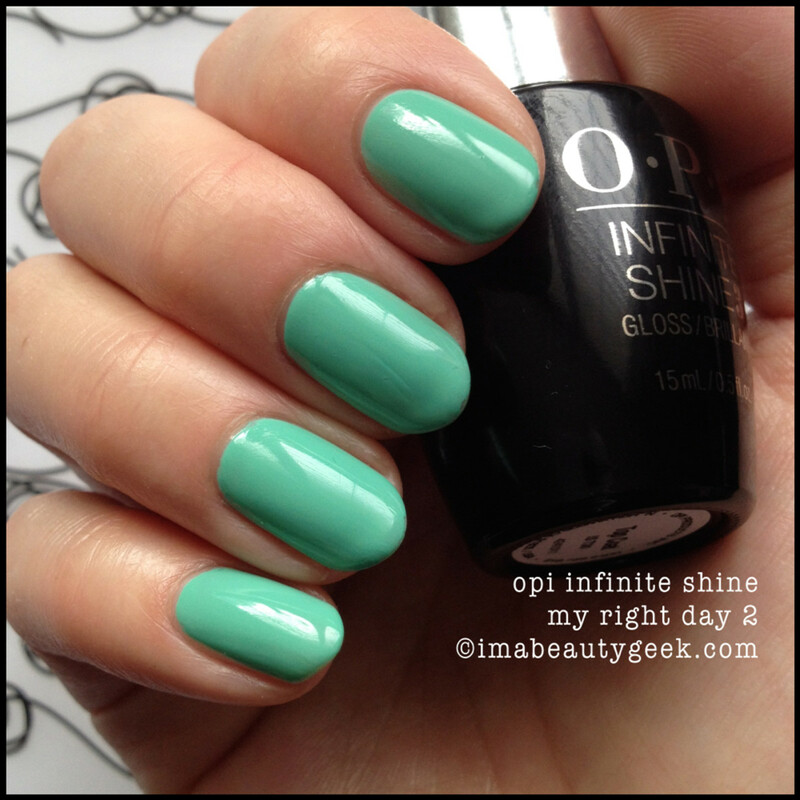 I think OPI Infinite Shine is stupendous! 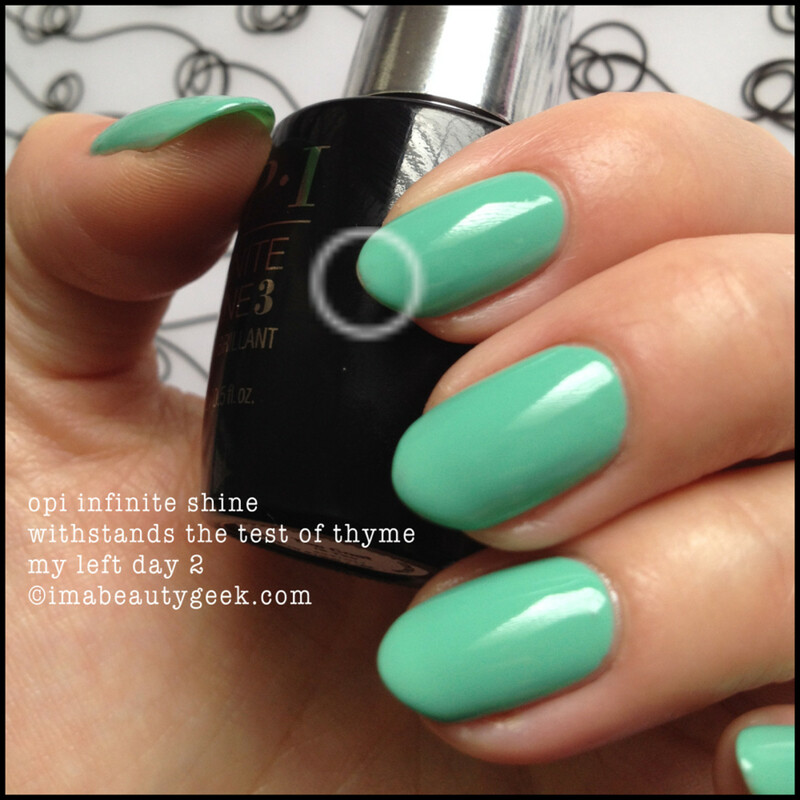 I also think the "long-wearing-ness" might depend on the shade and formula of the colour coat when combined with the top coat. I also think that just like the Sally Hansen Miracle Gel, the magic is actually in the top coat. 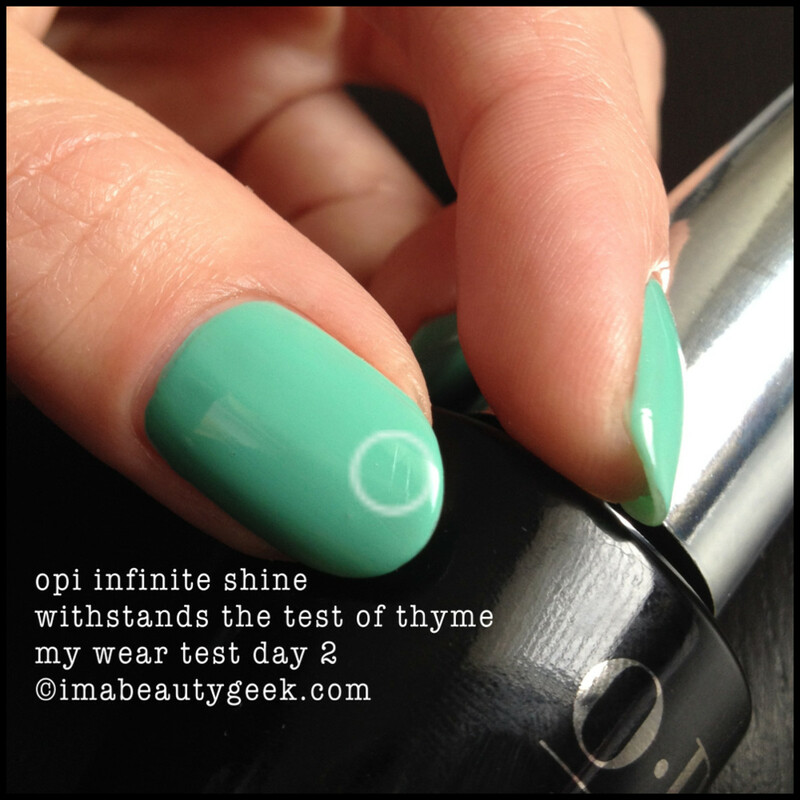 My theory is that because this top coat "cures" (which really means hardens) best in full spectrum UV light (which only really comes from the sun and not from a UV lamp), that without sunlight, it takes a long time to set up hard enough so you experience zero tip wear at all. What I mean is that if I had done my nails the day before I went to work for a full 8 hours, I think I would have shown far less wear at the free edges of my right hand. If I look at the almost total lack of wear on my left as compared to my right, it follows that if my right had more time to "cure" from all the artificial light sources around me, it would have made it through the four days in much better condition even though I used the crap outta that hand. I think if you don&apos;t have the job I do, you can do your nails whenever you want, sleep, get up and do your thing and get a good 6 or 7 or 10 days of wear. I really, really think that. It&apos;s up to you to let me know if I&apos;m right. You&apos;ll let me know how it goes for you, won&apos;t you? I tell ya what -- I think this stuff is equal to the magic that&apos;s stuffed into the Sally Hansen Miracle Gel top coat. If I&apos;d been able to stick my nails out into the sunshine for 5 minutes immediately after polishing, I think it would have set up much better and lasted wear-free much better too. But it&apos;s been cloudy and cold and snow-rainy and crap out so I couldn&apos;t get any of that good UV from the sky to test my theory. I&apos;m pretty sure I&apos;m right though. I&apos;m still testing. 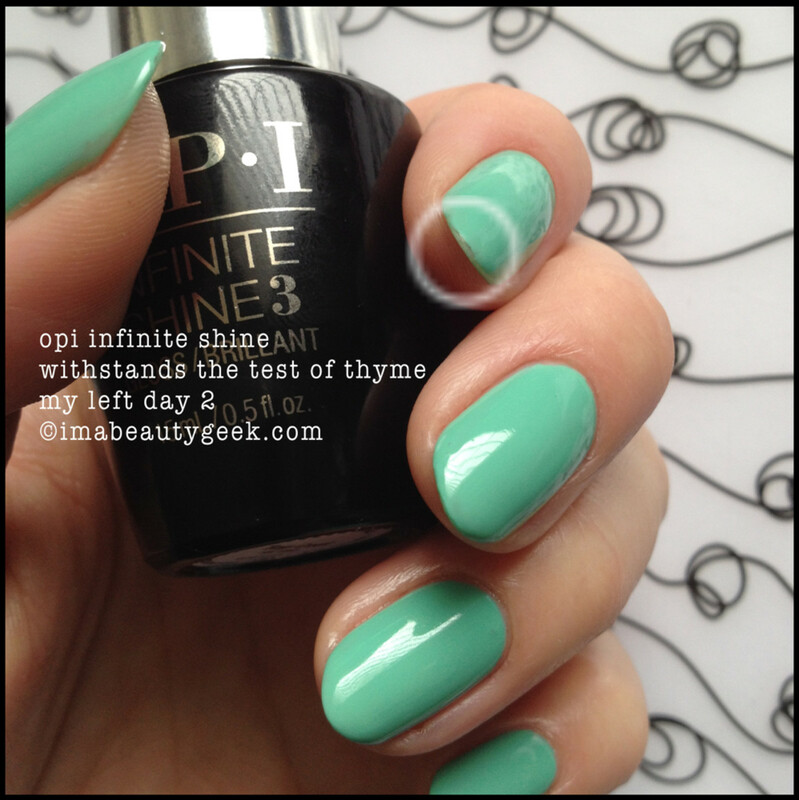 There are combinations of regular polish and Infinite Shine that need to be checked out and I&apos;m on it. Or maybe Amanda is on it. You&apos;ll have to hang out to see what we&apos;re up to. I&apos;m also hoping for a few more pictures from Amanda to see how her day 3 worked out. It&apos;s amazing to see the massive differences between our dominant and non-dominant hands isn&apos;t it? If I didn&apos;t use my right for evil, I&apos;m betting I could go maybe 7 days with this stuff. With regular stuff I never even get to 3 days when I&apos;m on vacation but I can see Infinite Shine goin&apos; for a full 7. I&apos;m amazed. I&apos;m gobsmacked. I&apos;m even a little bit surprised. Yep, surprised. And happy - I&apos;m happy &apos;cause the stuff really works - I mean, you&apos;ve seen the pictures! Questions thus far? Ask away - you know I&apos;ll answer &apos;cause that&apos;s how I do! Chat soon? Stay tuned to this post for the wear-test updates – we’ll add as soon as we can. 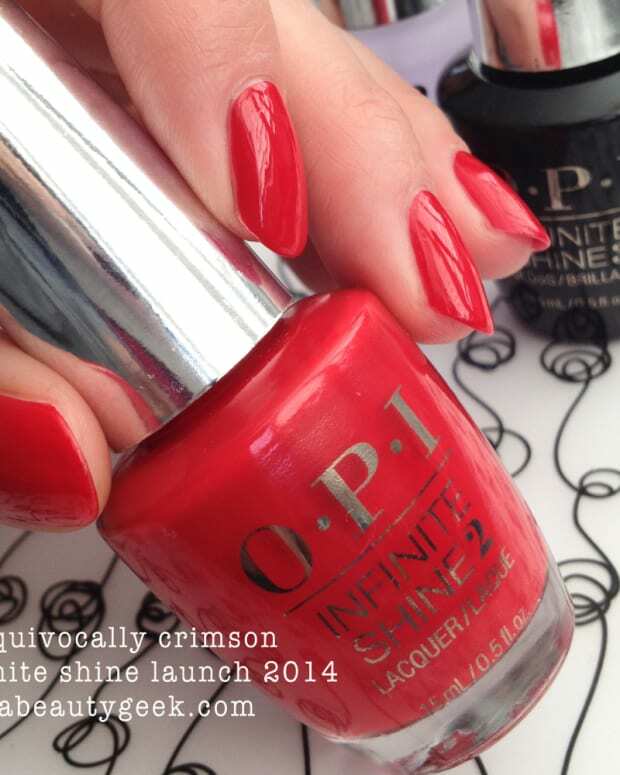 And hey, while you’re waiting for more information on OPI Infinite Shine, visit OPI.com. 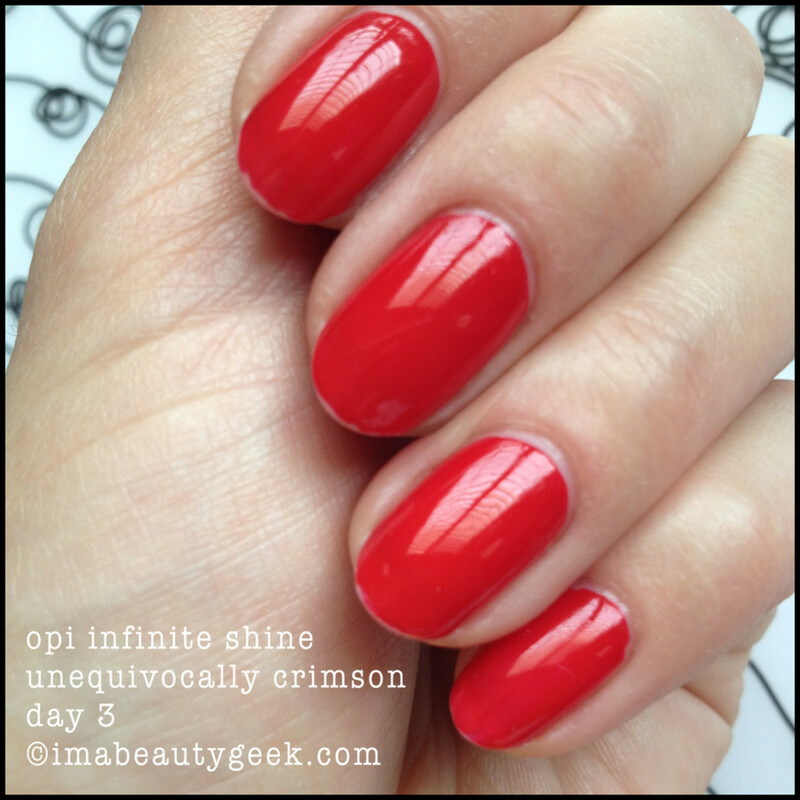 For more swatches of some of the other Infinite Shine launch shades, here&apos;s a nice linky to our OPI Infinite Shine Swatch post! 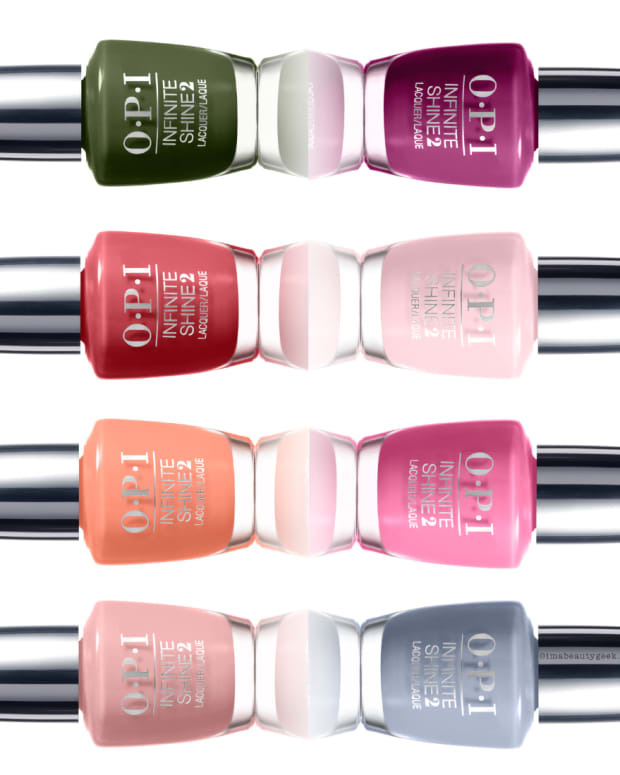 And a click-thru for our OPI Fifty Shades of Grey, and a click-thru for our OPI Hawaii Swatches too! Special thanks to Amanda – best guinea pig ever!